NKT protests along side the communist Chinese government against the Dalai Lama, using Shugdenism to undermine the Dalai Lama. 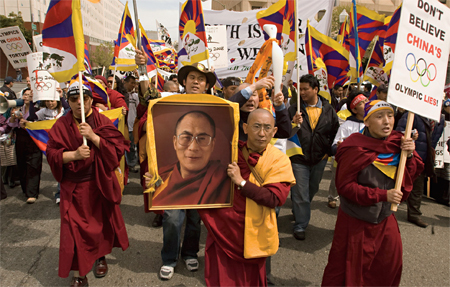 Previous essays have noted that NKT supports the overthrow of the Dalai Lama and his Tibetan government during the 1950s which followed with the destruction of most Buddhist monasteries by the Chinese as a cleanser against traditional Tibetan Buddhism which NKT sees as corrupt and degenerate because of its reverence toward the Dalai Lama. “And wouldn't China promote it (Shugdenism) bigger and better than anyone. After all they have economic power base that is growing by the month. We have to look beyond this generation alone. We have to look at China and her relationship with Dorje Shugden long after the Dalai Lama has passed on…China is making Dorje Shugden bigger and bigger." "Then from China, Dorje Shugden’s practice will spread to the multitudes of Chinese speaking areas of Asia, then the world. Everyone respects China either for monetary, business or cultural reasons. It is after all one of the greatest cultures known to man past and present. It will be the number one culture in the world as it has been in ancient times in the near future due to economic growth. Everything Chinese will be respected and proliferated in the world. In the near future, the tide will turn towards the east and that is China. Everything Chinese will be sought after, praised and valued. Even today, many governments do not wish to offend the Chinese government in hopes of securing lucrative deals. After all, isn’t bringing prosperity one of the main functions of any government whether Democratic or Socialist?…making Dorje Shugden the most popularly known Buddhist deity next to Kuan Yin in China at this time." “I approve the Chinese presence in Tibet. What we are living with the Dalai Lama today shows how authoritarian his theocratic regime must have been in the past. It was much more violent than what Tibetans are living today under Chinese rule...If we had to live with him (The Dalai Lama), we could have possibly been crucified." What are the Dalai Lama's views of China? ...here is a man who who appears to bear no grudge against the people responsible for invading his country, desecrating its ancient culture, and forcing him into an exile that has now endured for fifty years. He seems to embrace the Chinese occupiers with equanimity and kindness, to see them as suffering people rather than ciphers of a hostile nation, to regard them not as foes but as valued teachers who enable him to cultivate tolerance and compassion. And the more one observes the Dalai Lama as he travels the world, whether meeting presidents or addressing vast crowds, one starts to realize that this is not political or religious posturing, a cynical tactic designed to gain sympathy for his cause. This is the real thing: a man who cultivates and embodies the values he champions. Half a century later (following their invasion by Mao Zedung who claimed that religion is poison), the Tibetans still have not regained their country, but Tibetan Buddhism is on its way to becoming a world religion. In the early 1970s, those of us in Dharamsala would have dismissed as a fantasist anyone who suggested that the Dalai Lama would become a household name in Nebraska and "America's Fascination with Buddhism" would be featured on the cover of Time magazine...it would have seemed inconceivable that today retreat centers, temples, monasteries, and sanghas would number in the hundreds if not thousands." "A Buddhist monk cannot engage in war, not even in self defense." Does Kelsang Gyatso and NKT cultivate and embody the values they champion? Perhaps so. But, the values are not compassion and tolerance but rather political/religious posturing, hate and jealousy. Fortunately, the appeal of Tibetan Buddhism is far greater than the appeal of NKT.